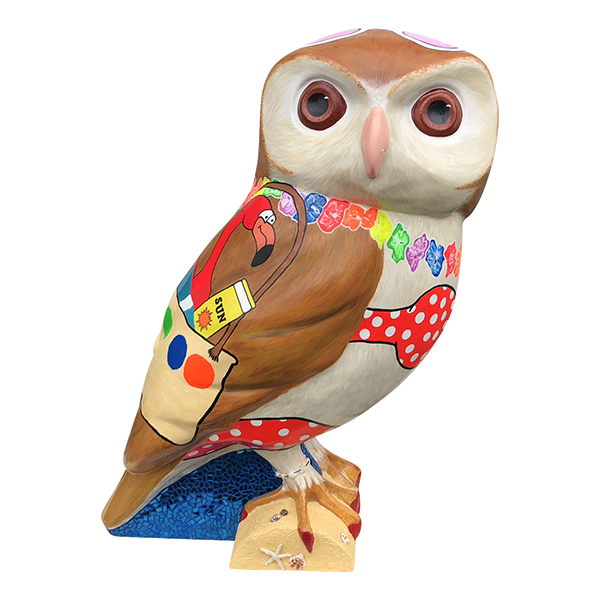 About the owl Summer is a beach-themed owl to mark the launch of the hotel’s new Beach Bar later in June. Sandy is ready for this years scorching summer and is dressed to impress on the beach..
About the sponsor With enviable views over the Rec and just a short stroll from the city, the County, soon to have 26 bedrooms, will be transformed into a boutique townhouse hotel and be home to a pop-up or two throughout the year – look out for Bath's first Beach Bar, which opens in June. About the artist Angus is a Bristol based, independent Artist. He has been creating works of art since early 2015. With no formal training and no background in art, has self taught and hit the ground running with his tongue in cheek style. Angus takes his inspiration from the people in his life, current affairs, iconic figures and the creative backdrop of the Bristol Art scene to help him create his unique works. Where? County Hotel, 18-19 Pulteney Rd (South), Bath BA2 4EZ.